There is a difference between knowledge and wisdom: knowledge is knowing that a tomato is a fruit, wisdom is knowing not to put it into a fruit salad. That was the fundamental premise when just over a year ago the Omega Envoy Team, the only student led team, became an officially registered team in the Google Lunar X PRIZE. As student engineers we desperately wanted more than our classes could give us, we wanted the chance to build real space hardware that we would get to see in action! Just over a year later we are so happy with the huge amount of progress we are making towards our dreams of reaching the moon. 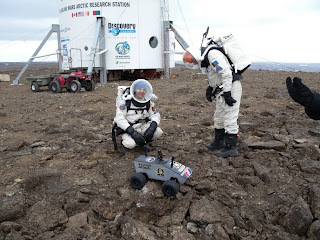 This past summer we were invited by our friends at 4Frontiers Corporation to send our rover prototype on a research expedition to the Mars Society’s Flashline Mars Arctic Research Station (FMARS) to test some of our components in a realistic “lunar” environment. It is true, you can sit with your team and design all you want, but until you get out in the field and run some real tests you will never be able to make true advancements. We learned a lot during this expedition and today are building off the lessons gained from controlling our rover from over 3,000 miles away! However, one of the biggest lessons we learned was that we were quickly getting tired of calling our rover prototype “Rover 2.0” every time we made a blog post or tweet on the expedition. So during the expedition we opened an online contest for Omega Envoy fans to help name our rover, with the end goal of leaving it up to the public to choose the name and play an important role in helping us reach the moon. In the end we narrowed the entries down to the top three names and held an online poll to see what the name would be. The three rover names that made it to the finals were Elroy, SAGAN, and Knowledge; all of which would have made awesome names for the first commercial rover to make it to the moon. We were so excited to see over 140 people vote with SAGAN and Knowledge in a tie for most of the polling time! In the last week of the poll SAGAN pulled ahead by just six votes. So today we are very happy to announce the name of the Omega Envoy Rover to be SAGAN, after the late Carl Sagan. I think we can all agree that the name is quite fitting and we think Carl Sagan would be very proud to see his legacy live on as we once again go back to the moon.